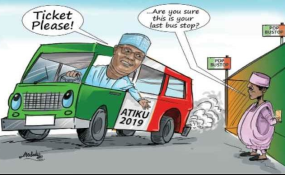 Abuja — Just when Nigerians thought that the controversy surrounding President Muhammadu Buhari's school certificate had been rested, the Peoples Democratic Party (PDP) and its presidential candidate in the February 23 election, Alhaji Atiku Abubakar, has resuscitated it. In the petition filed at the Presidential Election Petition Tribunal on Monday to challenge the president's victory at the poll, Atiku alleged that Buhari was not qualified to run for the office of the president on the grounds that he did not possess the constitutional minimum qualification of a school certificate. In the 141-page petition, which contains five grounds, the former vice president and the PDP asked that they be declared the winner of the election. In the alternative, Atiku asked the Presidential Election Petition Tribunal to nullify the election and order a fresh one that would be counted in line with the country's electoral laws. The petition was filed against the Independent National Electoral Commission (INEC), Buhari and the APC, as first to third respondent, respectively. Names of 21 Senior Advocates of Nigeria (SANs) and 18 other lawyers appeared on the petition. The five grounds of appeal, read, "The 2nd respondent (Buhari) was not duly elected by majority of lawful votes cast at the election. "The election of the 2nd respondent is invalid by reason of corrupt practices. "The election of the 2nd respondent is invalid by reason of non-compliance with the provisions of the Electoral Act, 2010 (as amended). "The 2nd respondent was at the time of the election not qualified to contest the said election. "The 2nd respondent submitted to the 1st Respondent an affidavit containing false information of a fundamental nature in aid of his qualification for the said election." Speaking with journalists on the petition, the PDP National Legal Adviser, Mr. Emmanuel Enoidem, said over 400 witnesses have been assembled from all over the country to testify during the hearing of the petition. Atiku and his party are challenging the electoral victory of Buhari and the APC on the grounds of alleged massive rigging, malpractices and non-compliance with the electoral laws.